Honestly I wasn't quite sure I'd get my project done this month. I really waited way to long to start. I had to find and purchase nearly all the fabrics. The stripe was by far the hardest. Beverly's in Kearny Mesa on Balboa Avenue was where I was lucky to find it. There were 13 FQs required, so I picked up a bunch of them at there too. The rest were found in my stash. Paradise Sewing is where I found the black print. 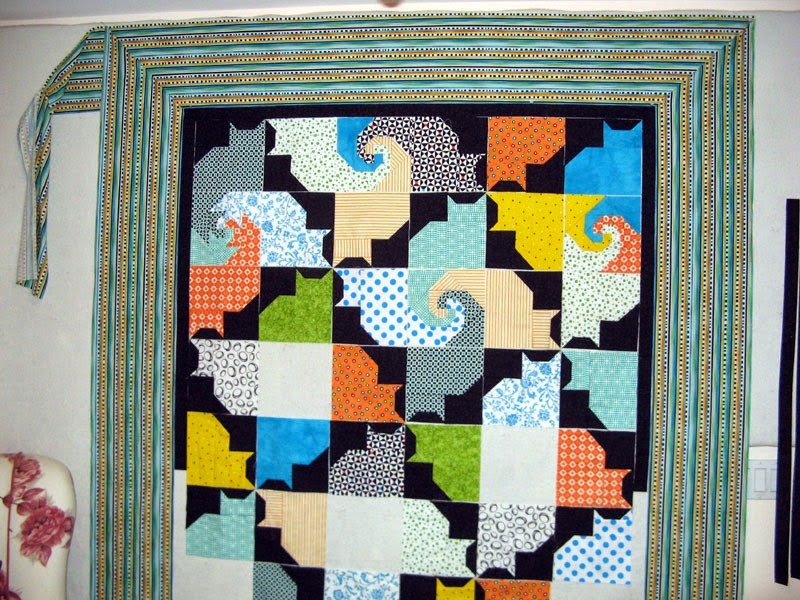 My border isn't as wide as the pattern called for; therefore the overall size of the quilt is just a bit smaller. 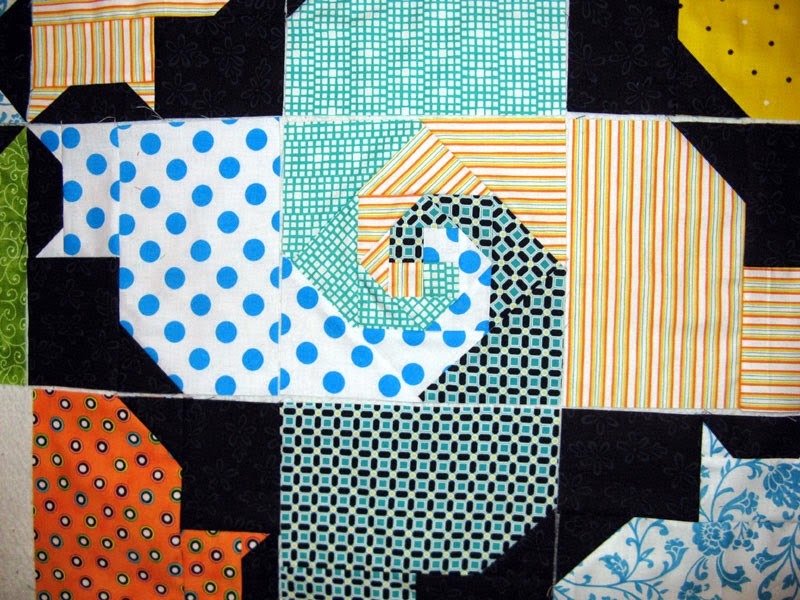 It comes down to how wide the repeat is on your stripe. I did a pretty good job with matching the stripes in the mitered corners...don't look too close though! 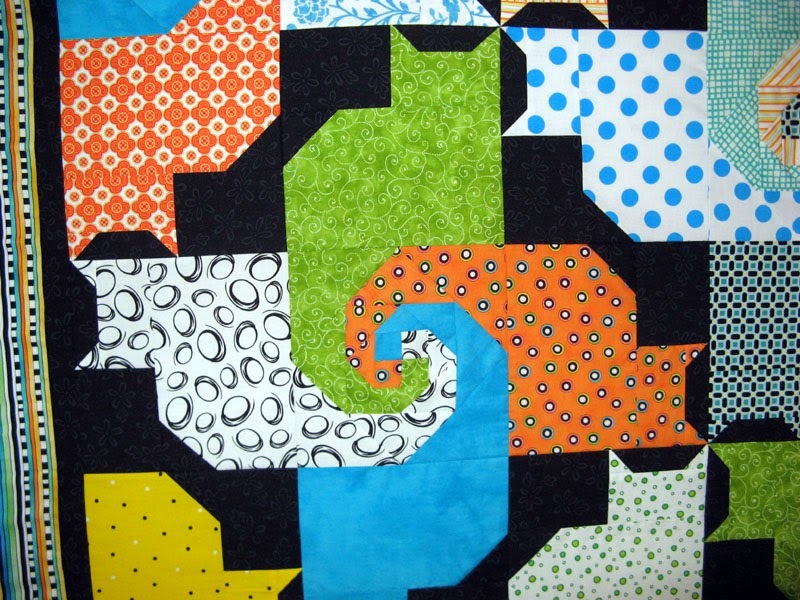 The snails trail block piecing was the time consuming part of the design. I only messed up one during its sewing. There are enough pieces cut that I was able to get around this without taking it a part. One cat block is left when you put the top together. I'll do as the pattern suggests and use this as a label. I just might have something in my stash for the back; I'm hoping so. 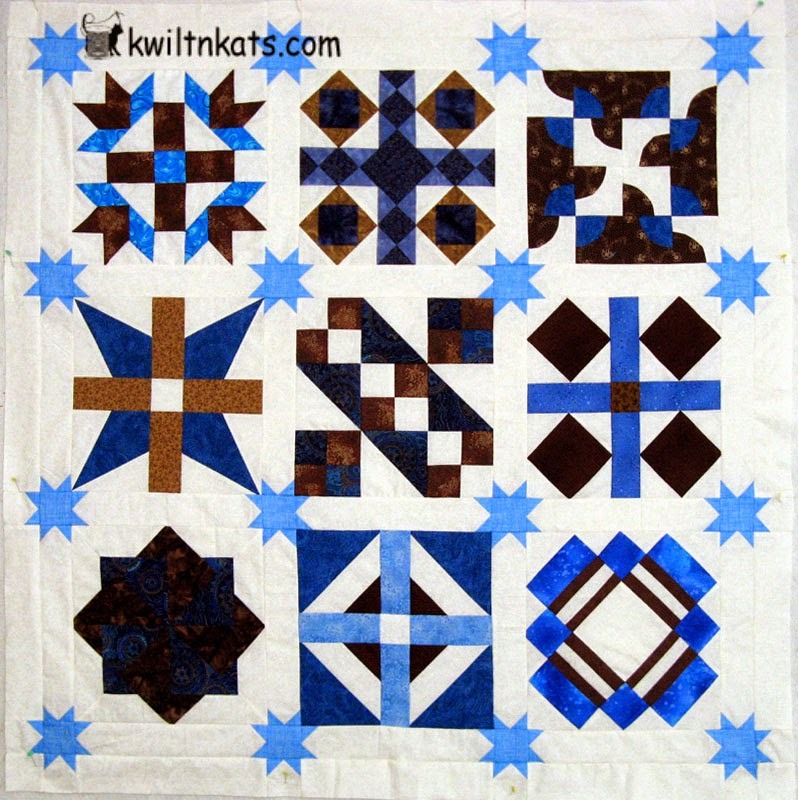 The design is called Kool Kats Kwilt by Patti Carey for Northcott. My project will be called Kurly Kats. I'm ready for August's UFO. This time I hope it is one that I have already done...or at least started. 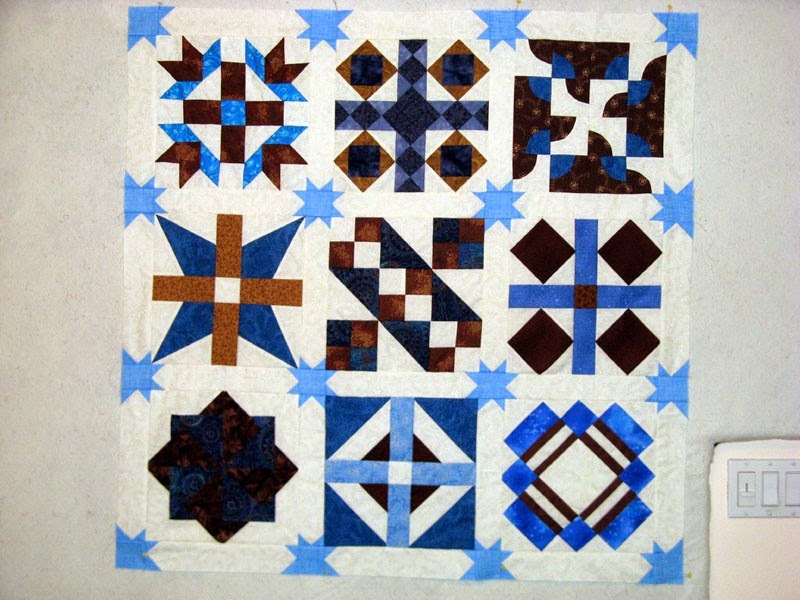 Tune in on Friday, August 1st if you want to see all the other finishes through the links of 52quilts. I'm moving right along now... All the cats were finished by mid day on Sunday. These were the quick and easy blocks. Then came the snails trail blocks that are making up the cats tails. There are a lot of pieces in the block that make it a bit slow going. I have a several more to go. I still have enough time to get this UFO done in July. I had to cut the stripe fabric and try it out. I'm really liking what I see. The corners have to be lined up correctly and you can see they are to be assembled the miter way. Hope your projects are moving along. Can you believe this week marks the end of July 2014? 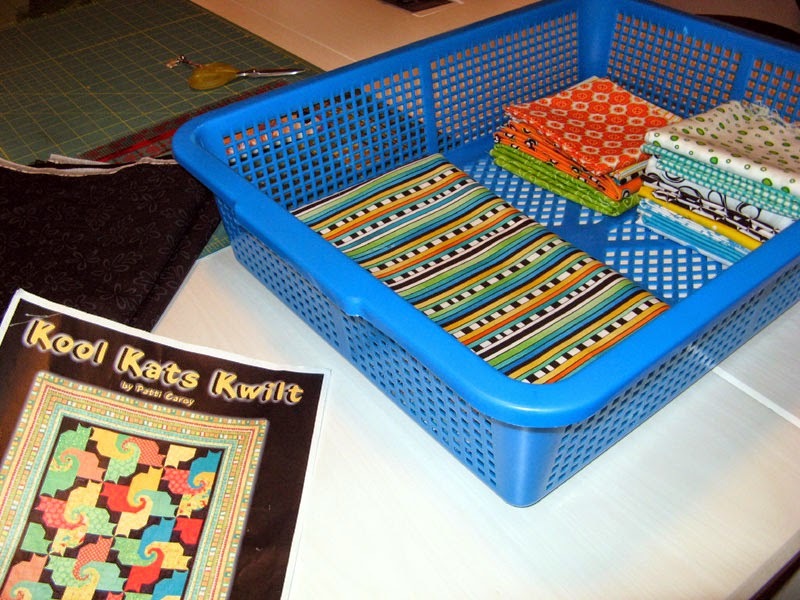 See other projects through the links of Patchwork Times. I'm writing right now to the sounds of thunder and rain. So unusual for this time of year in San Diego. The humidity has been high too. The storm brings in a nice breeze and no one is upset for rain in San Diego! We are in a mandatory water cut back...it is needed so bad around here. I have a little bit of stash used to count this week. I was able to finish lots of projects last week and cut the pieces for my July UFO. 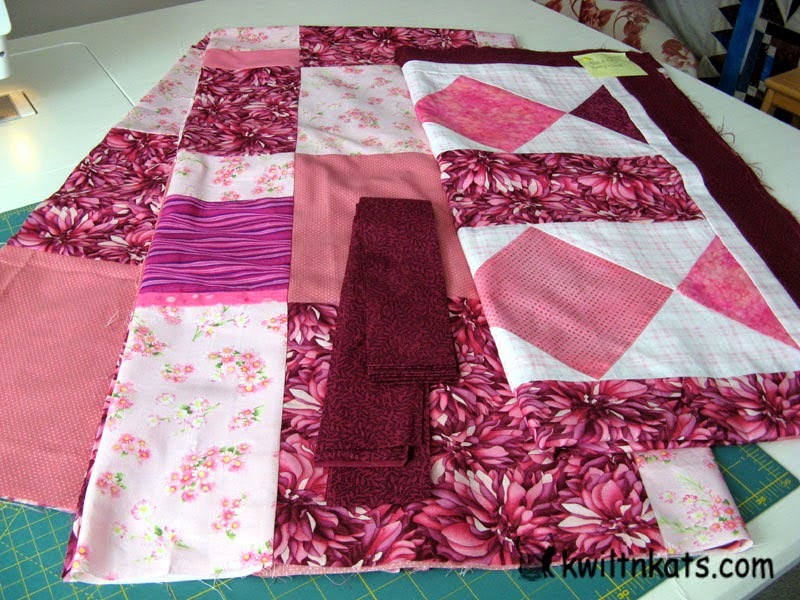 Yesterday I put a bunch of quilts into Kerry's quilting queue too! I also stayed away from the quilt shops, but this doesn't mean I'm not still in the hunt for fabric... I have to find a 1/2 yard piece of brown plaid for a binding. 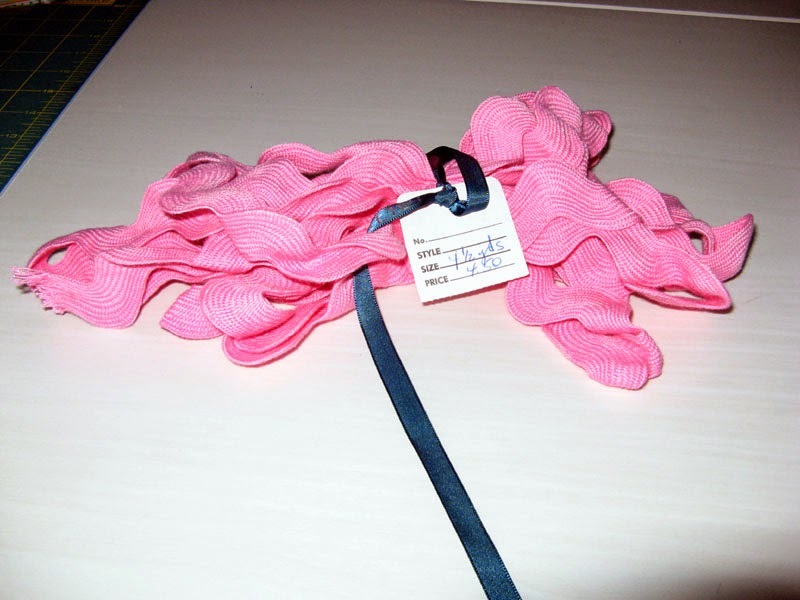 Then there is 12 yards of 3/4" and 6 yard each of 1 1/2" two colors of rick rack to find. I'll need to start pulling what I can from my stash for the Buggy Barn Bird Brain workshop that is in the middle of August. Once I know what I have I'll decide on the colors of rick rack. I do have some pink rick rack that I may work; we'll see about that. Two nights this week I spent time weaving on rug 2. I'm making a matching one for in front of the kitchen sink. I figure right now that I'm about a third of the way. I'm determined to use every 2 1/2" strip FIRST before I cut into yardage. Kerry has offered her browns and greens; it would be a delight for her to count a bit more used on her stash report as well. I'm not ready to claim fabric used yet, but these rugs take 17 yards. 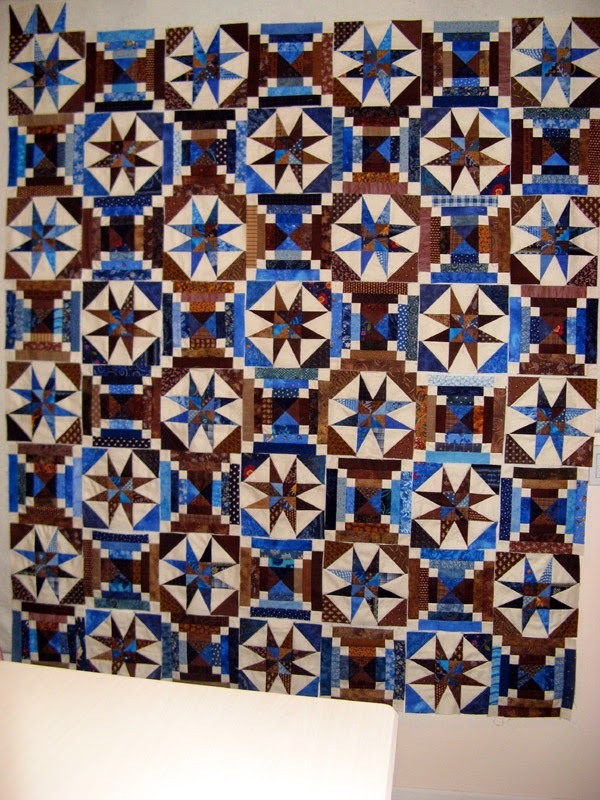 I did end up finishing off the stars in the border of the Retreat Quilt. This is one that went to Kerry's on Saturday. I'm going to guesstimate on yardage used for this project. 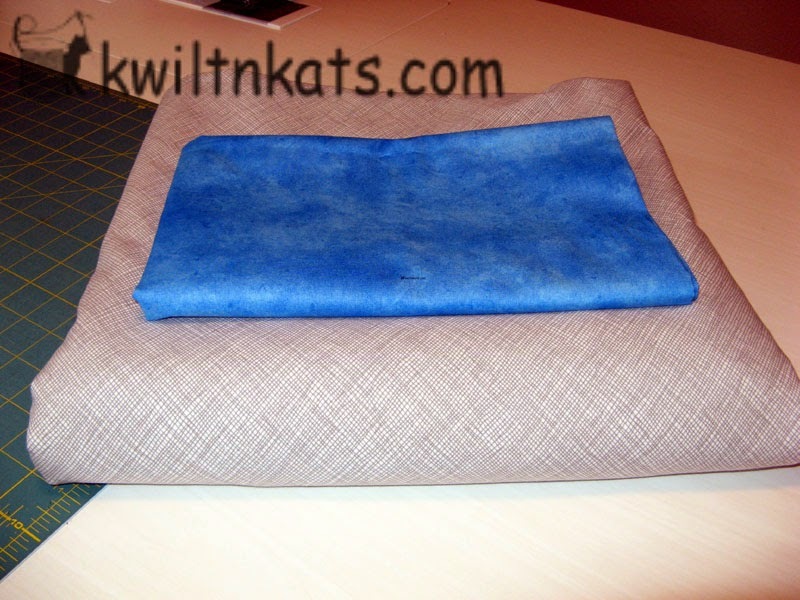 I provided all the blue that will also include the binding and the brown except for the block Shelly made. The background and back came from Sue. So let's say 1 1/2 yards for this project from my stash. The San Diego Humane Society Fur Ball Donation was finished. 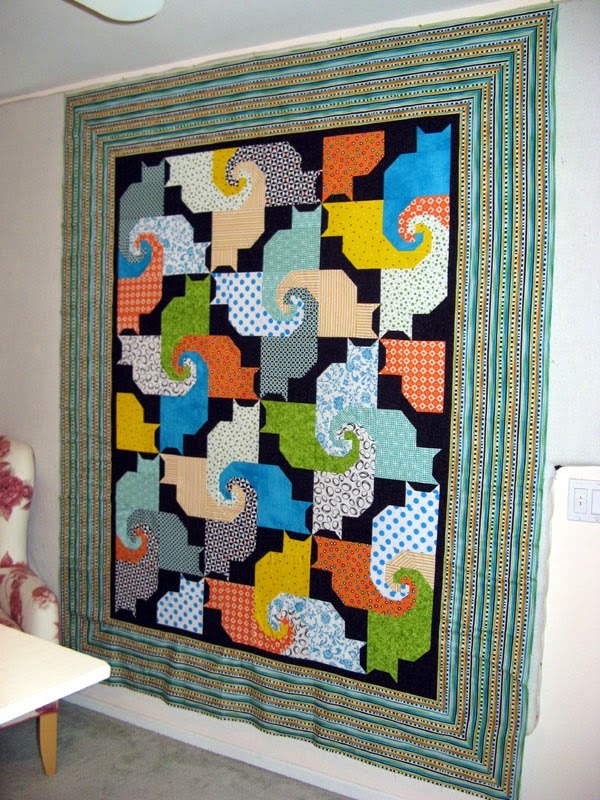 Kerry probably has this one quilted now. It was on her long arm yesterday with two rows complete of the cutest stitching design that looked like Hello Kitty in yellow thread. 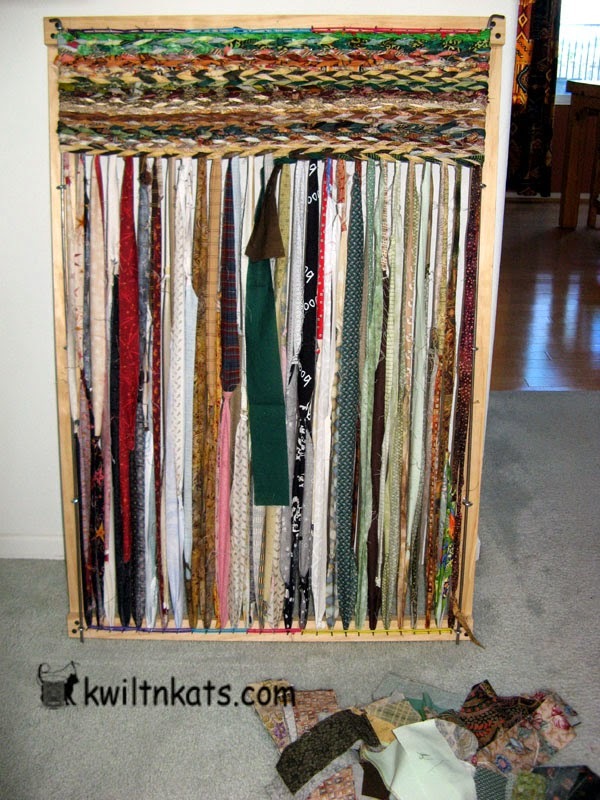 Kerry provided the backing on this project that we do annually so my used stash is 3 3/4 yards. Koko is hiding under the bed! I think my cat is a chicken... It's still raining YIPPEE!!! I decided to finish off the star border. So another round of 2 1/2 " sashing with the finishing star tips has been sewn into place. 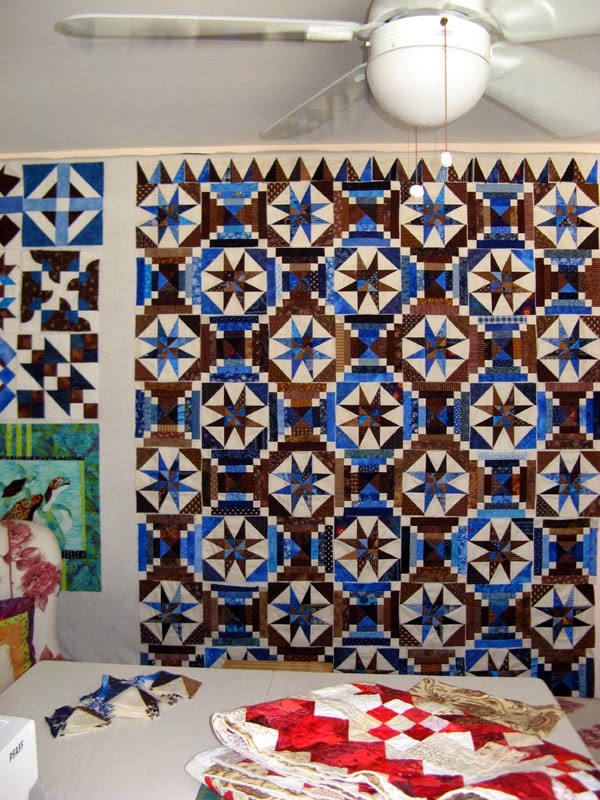 The quilt measures 47" square. I think it's perfect for the space we planned for it to go; on the wall in the dining of the retreat facility. Sue brought in more of the neutral for the back during the week. Kerry will get it next for the quilting. When she is done Bonnie will get it for the binding. Blue that matches the stars is still set aside for that. I've been working the last couple of nights on my second rug. 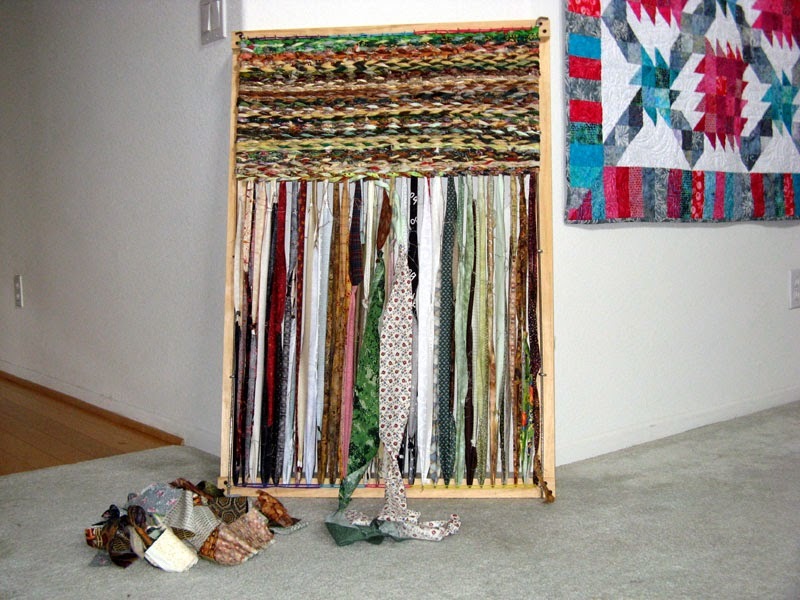 The breeze by the window as I weave is wonderful during these last few very warm San Diego evenings. One more day this week before the happy dancing can start. After all the time I've been taking off lately with family visiting this has been one very long five day week. I'm sure glad tomorrow is FRIDAY! Sunday was a busy sewing day. I finished the San Diego Humane Society Fur Ball donation. I really think it came out cute. It was a fun design to put together. It has lots of character don't you think? 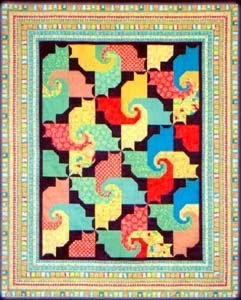 The pattern is from Heartstring Treasures by Patti Bartlett and is called Cat and Mouse Games. Kerry has it next for the quilting. We need to have it for the event the first full week of August since the event is August 16th. I'm happy to have it done. 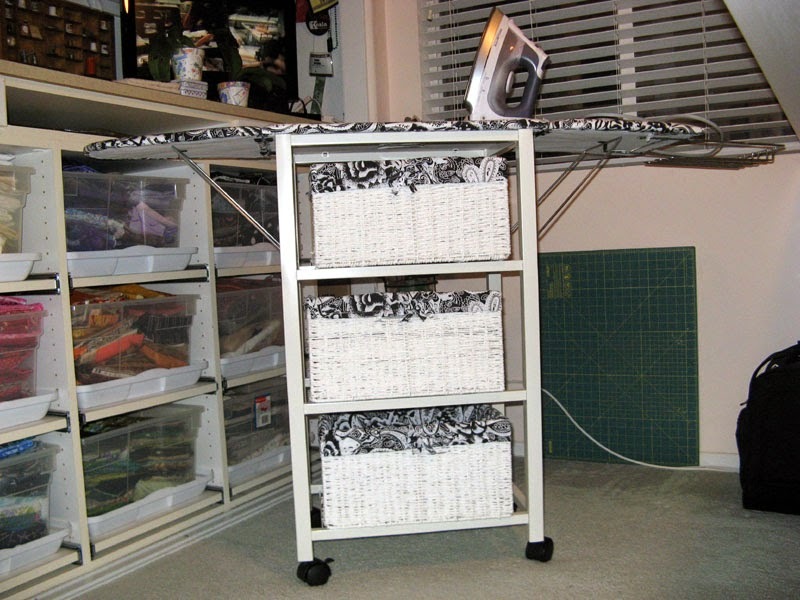 Thursday the new ironing center arrived from Improvements. I really like how handy it will be. 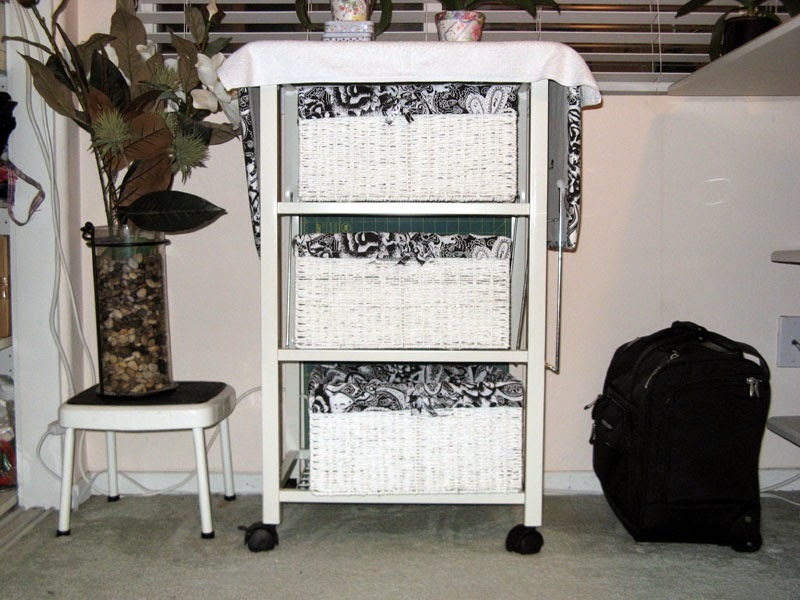 The ironing board folds down as you can see, on sturdy rolling wheels and three good size baskets for storage. I especially like that I can close it up roll it under the window and place several of my orchids on top to soak up the north facing window. Next I'm ready to tackle my July UFO. I have all the fabrics ready for cutting. The design isn't complicated so there shouldn't be a problem with just under two weeks before the end of the month. It is called Kool Kats Kwilt from Northcott Monarch by Patti Carey. Hope you have the kind of week you love. 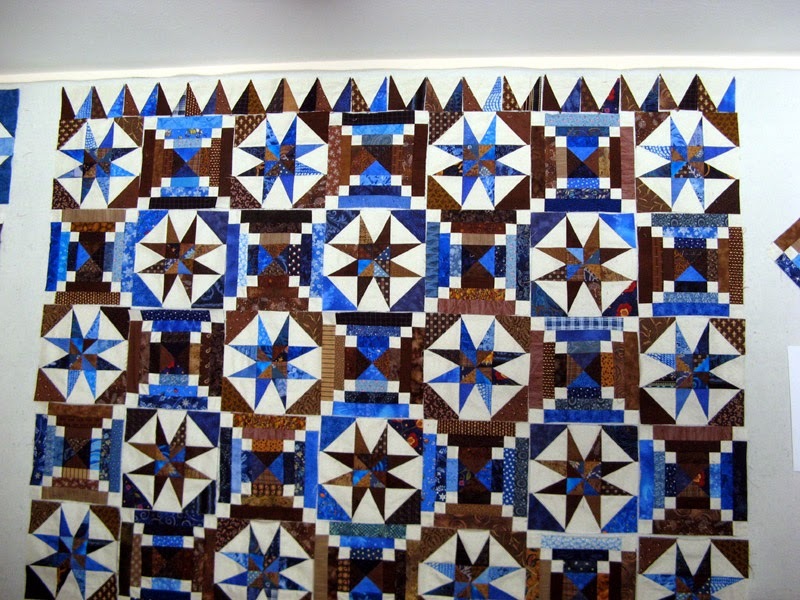 See other great projects through the links today at Patchwork Times. Oh and tell Judy...feel better soon. Beverly's 13.75 yards on Friday 7/18. Paradise Sewing 3.75 yards on Saturday 7/19. Did damage to my stash statistics! Every piece has a place right now...believe it? From Beveryly's on the top on the left 8 yards that backs two quilts Kolumbia and Kootenay Kabins (this name may change yet). Center fabrics are for my July UFO Kurly Kats that you can see I am way behind on starting. On the right, red for the binding of Kranberries and the dot may end up being the outside border for the San Diego Humane Society Fur Ball donation (another one that I am behind on, but it is started). 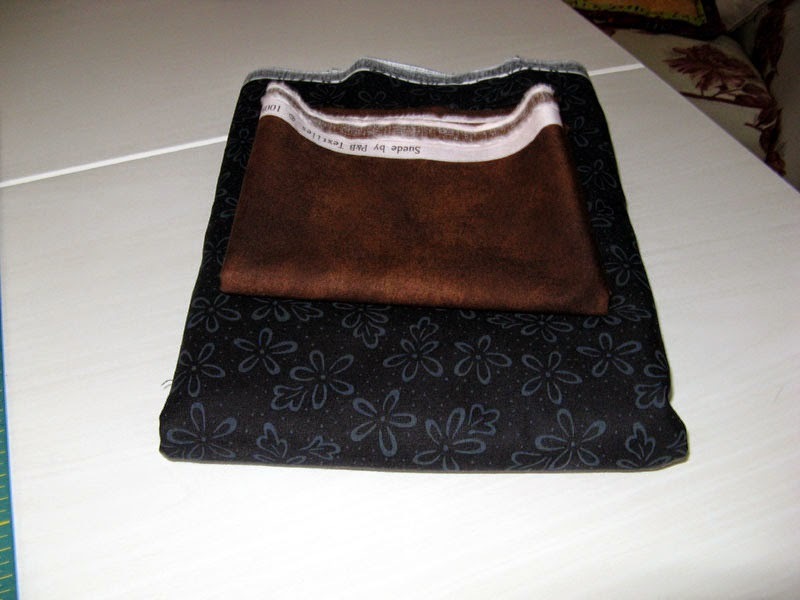 From Paradise Sewing the brown is also for the San Diego Humane Society Fur Ball donation and the Black print will be the background for Kurly Kats. I assembled the Bible Blocks into a top over the weekend. These blocks were made at the retreat we did in June. The setting works out well. Not sure if I'll finish out the stars in the outer border or leave it a is. There is enough of the light blue to use for the binding. Thinking ahead I have come up with a label that shows the block names and maker. Thanks for a Great Place for Us to Sew! 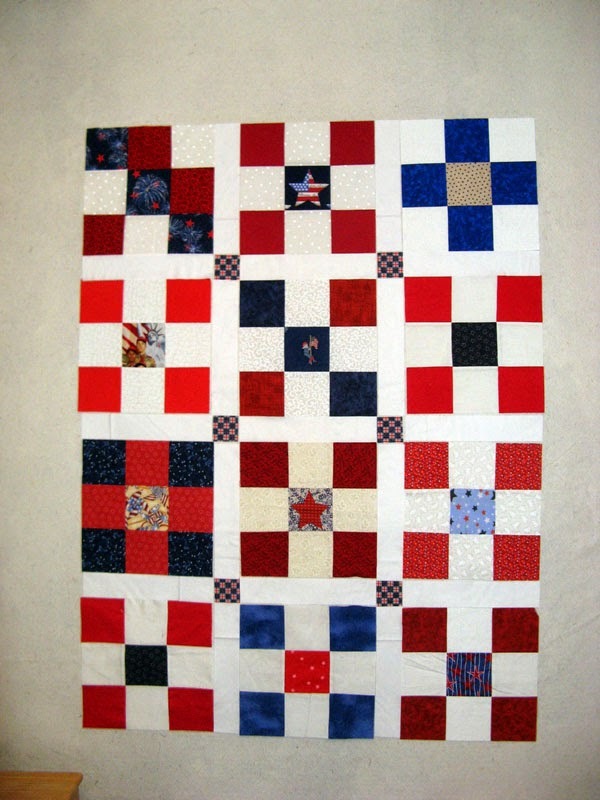 I assembled the second Patriotic Block top today after dinner dishes were done. I decided it needed to be just a bit larger. I found in my stash this fun Patriotic fabric to work out well. The top and bottom border was just a little bit too large for WOF. I found a bright red with a white pin dot to add into the corners. It has finished 8" around larger than it would have been. A much better size. In the next few days the two quilt tops and a special edition Apple Pie flavored Thomas's English Muffins will be in the mail to Southern Maryland! On to the San Diego Humane Society's project next. Hopefully my off Friday will see a lot of progress on it. I'm at the stage of using a light box to transfer markings from the pattern to the fabric. I used Wonder Under to fuse the pieces to the background. I sure like Steam-A-Seam better, but its just not available now with all the manufacturing problems they've been having. If you happen to have some treat it like GOLD! 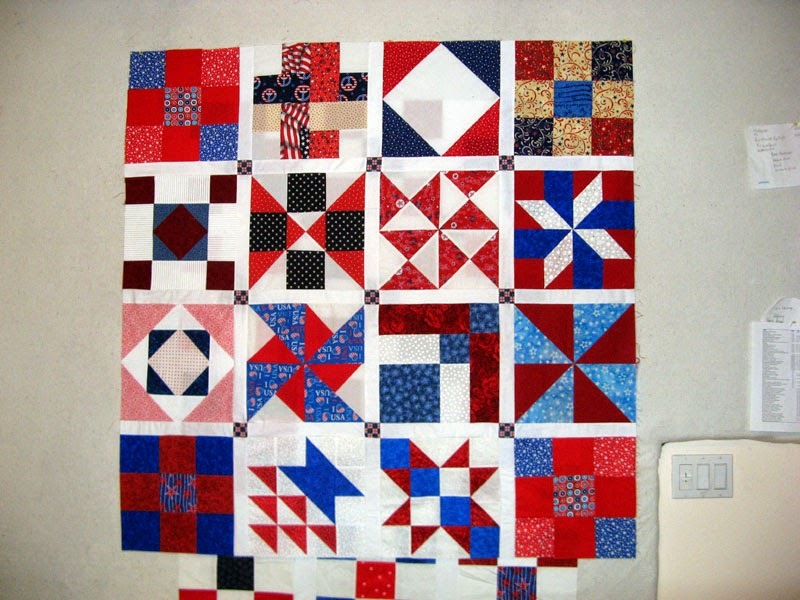 When Mom came to visit she brought with her a Patriotic Block swap that she participated in a few years back. 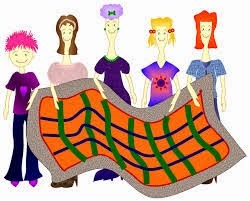 It was an online swap coming from all sorts quilters from all kinds of places around the globe. Along with a swap come the differences in a finished size... Needless to say it became a challenge to put the blocks together. We never find enough time to do all that we set out to do during her two week visit. 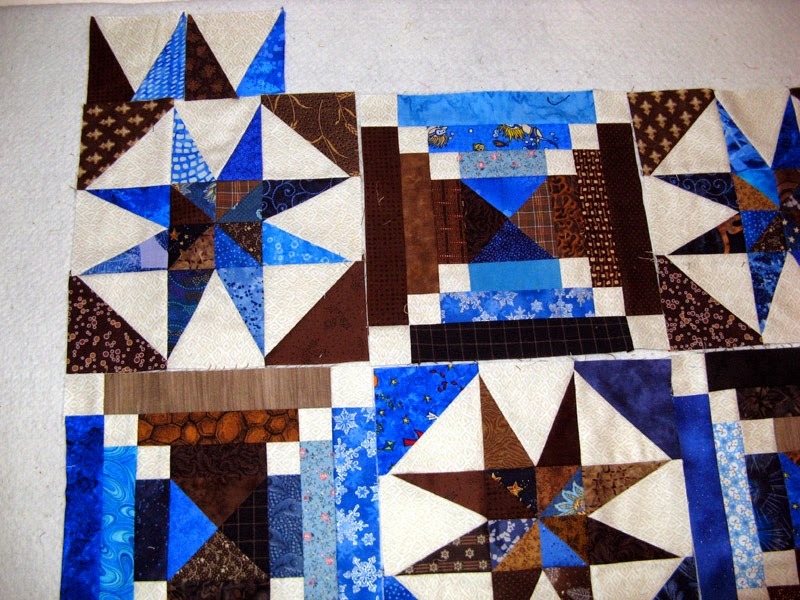 I have the first set of blocks assembled into a top (above) and the rest of the blocks ready to sew together (bottom). I used a white on white dot for the sashing with a blue/red/white check for corner stones between the sashing. 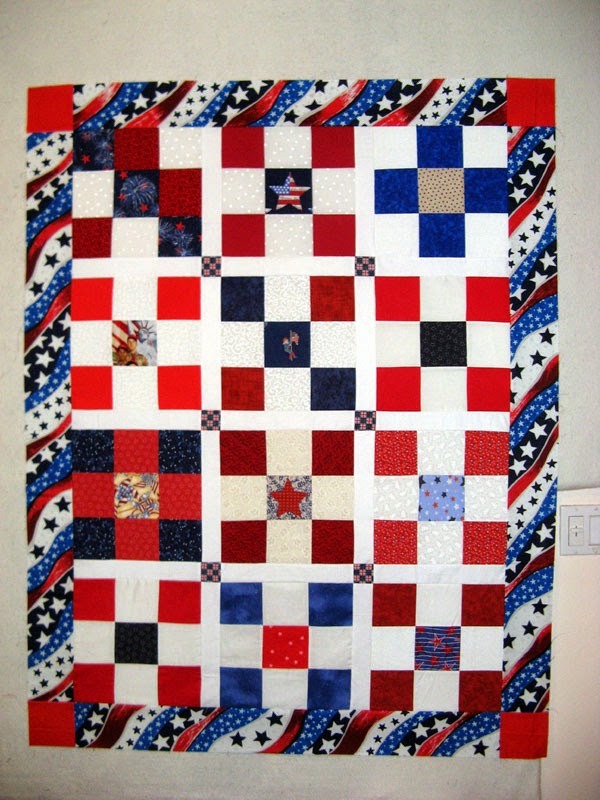 These will both be quilted by a long arm quilter in Southern Maryland who does charity works and donated to either a Veterans home or hospice house in her area. Someone deserving will definitely cherish these. My Smith Morning Mountain project is done. I just love how this Bonnie Hunter design turned out. Hopefully it can get quilted and bound before October when Bonnie will be here. I'm planning on a dark blue for the binding. Will need to audition threads but I'm thinking something neutral will be best. These are the blocks for the retreat location that need to be set. They are all from the Bible Quilt blocks series that can be found at www.patternsfromhistory.com. At the moment a straight setting is planned. Will need to use some coping strips with these. 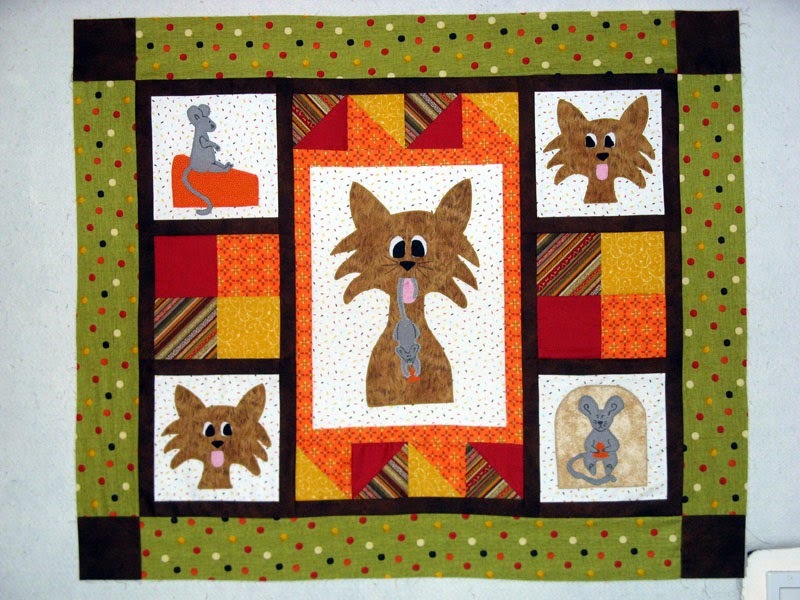 Next up is the San Diego Humane Society's fundraiser quilt. 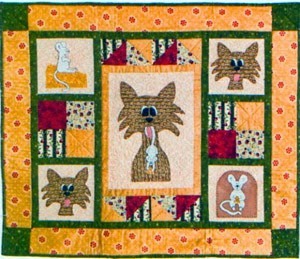 This is the design we will be making by Heartstring Treasures (Patti Bartlett) called Cat and Mouse Games. Kerry and I have been doing this now for several years. It will be auctioned off during the annual Fur Ball held the third week of August. Last year we made a dog theme...this year will be cats. After Cat and Mouse Games comes my July UFO. I sure hope Cat and Mouse Games goes together quickly. My UFO is also with cats...surprised? This one is by Patti Carey called Kool Kats Kwilt. 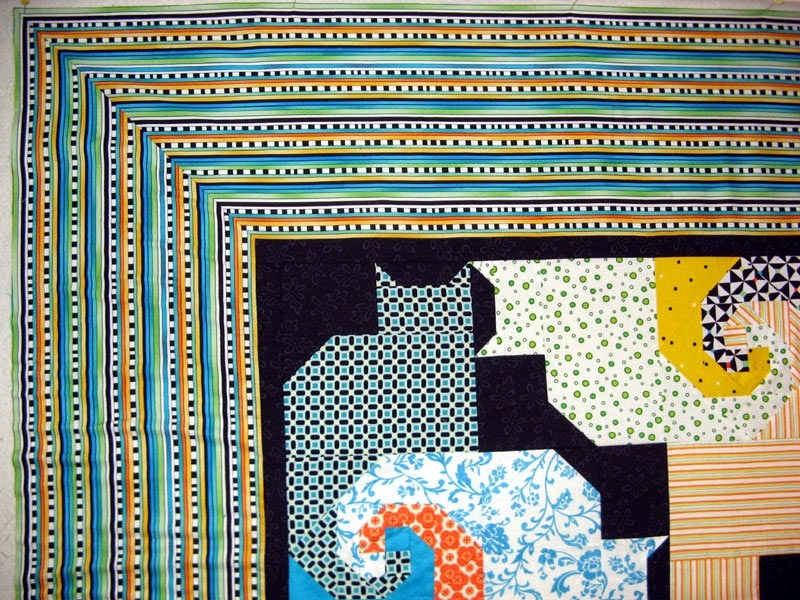 I think I'll go with the bright fabrics, but not sure about the border which in the design uses a cat stripe (#2147-67) that was produced by Northcott. This pattern has been around for some time so finding that stripe might be impossible. I'll make something work. 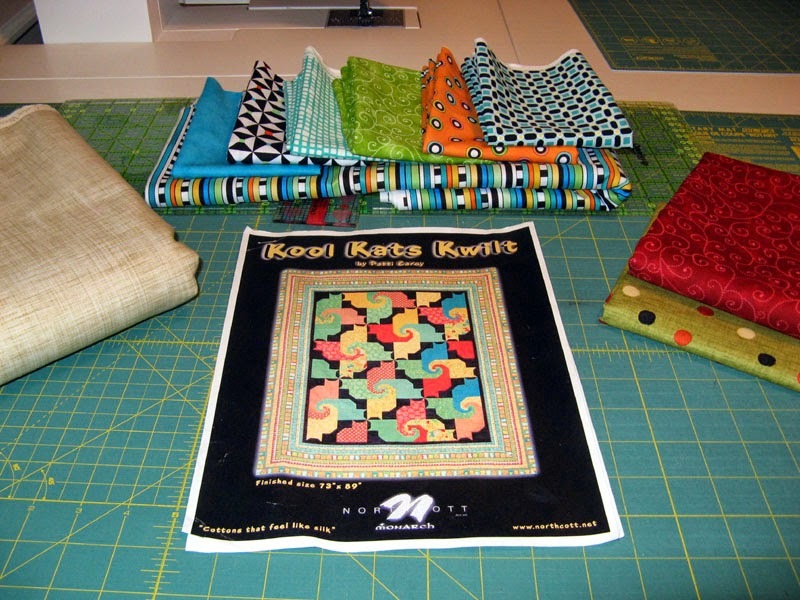 I signed up for two classes at Road to California Quilt Show. 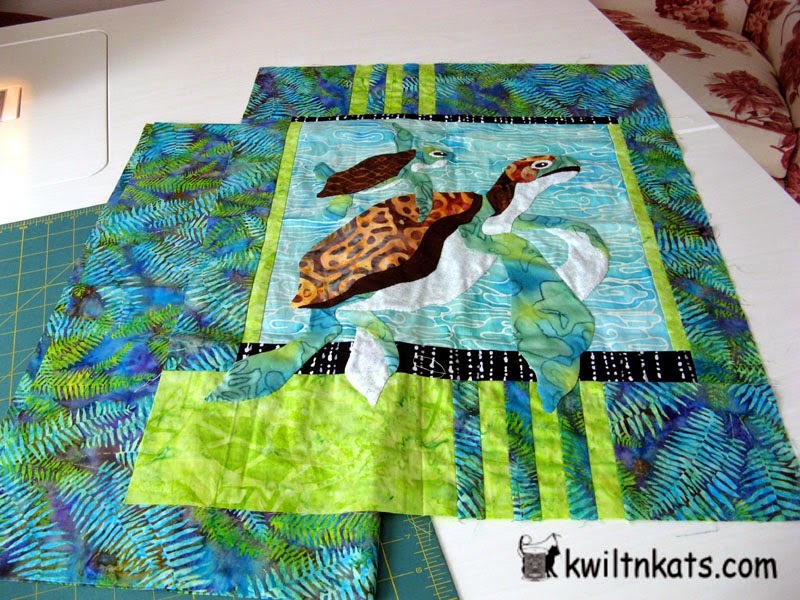 Thursday is the first class called Batik Feathers and Friday will be the Downtown Abbey Mystery I. I will be entering four quilts for show consideration. I need to pen the Artist statement...the hardest part of the entry application! Krackerjack, Kilowatts, Krossfire, and Kookaburra are what I'll try to get into the show. 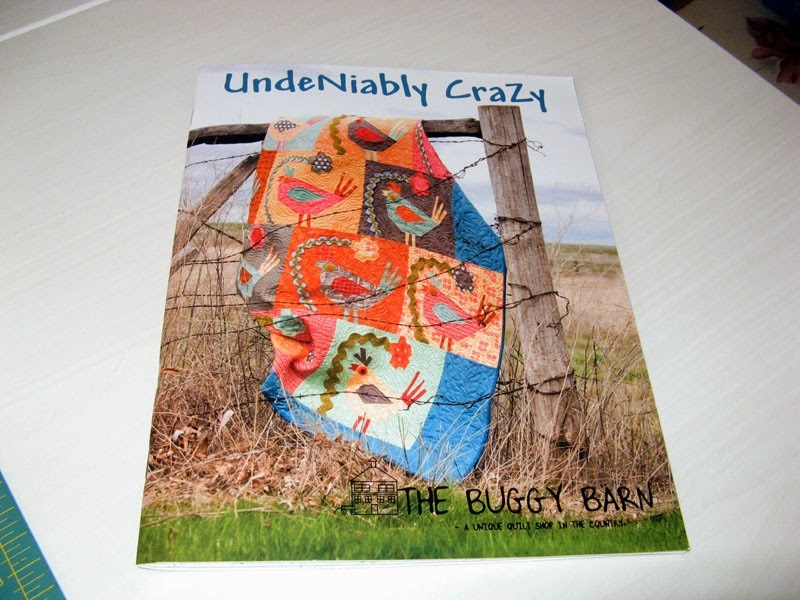 More projects to admire today through the links at Patchwork Times. Let me begin with a purchase. I knew I had to have this wide back when I first saw it. It turns out that Lynne liked it for a project she was working on. I went this week to Beverly's where I bought the rest of the bolt. Lynne will probably need 3 yards for her project and...mine is added to my stash for something that will need it in the future. The piece is used in my Smith Morning Mountain project. I purchased 1 1/2 yards thinking I'd use it for both the inner border and binding. It is a little bright so I've changed my mind to use it only for the inner border then go with a darker fabric for the binding. Now let me finish with fabric used! Kooter Klan is finished. I have all the applique done and now I'm ready for Kerry to take on the quilting. 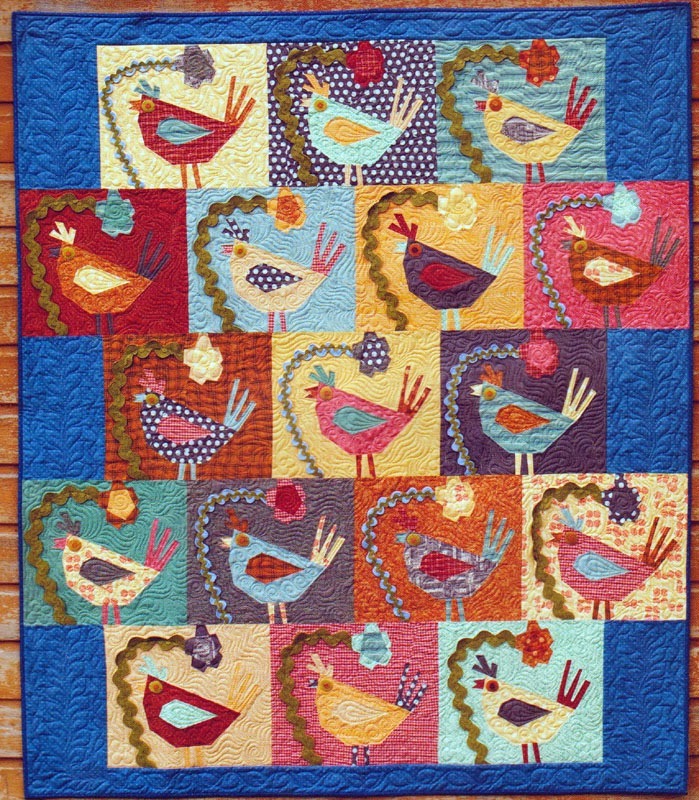 Kooter Klan is a design called Newly Hatched by Java House Quilts. When my Mom was here a few weeks ago she made the quilt top that sits on top of these fabrics. Sorry I don't know the pattern. 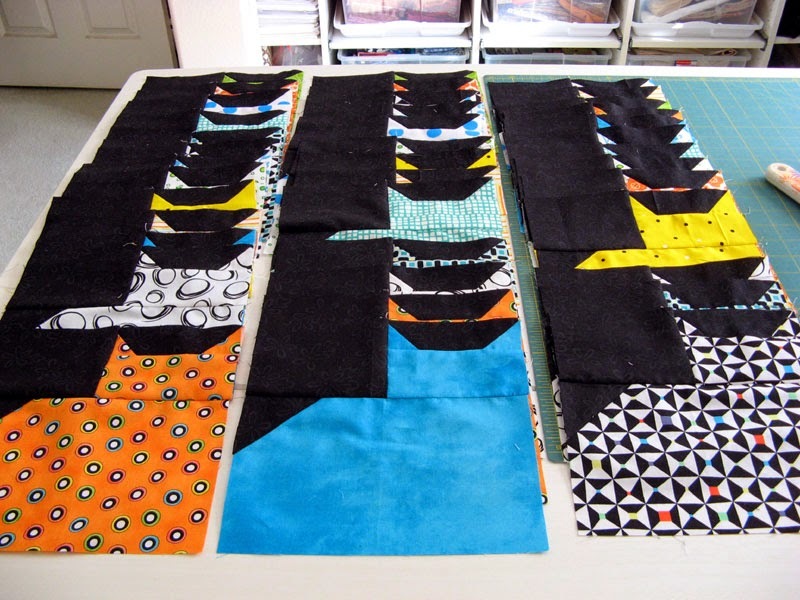 Yesterday I finished the cutting of 10" squares with all leftover fabrics and put a back together as well as cutting the six strips she will need for the binding. Most of the fabric she brought from her stash of pinks. I did supplement with a few, but never took the time to count what was coming from my stash. Kerry will have this one to quilt as well. Tiffany will have Karibbean in her home soon. She selected it from dozens that I have around my home. It is made with all blue batik scraps. I remember only purchasing the light blue neutral for the project. 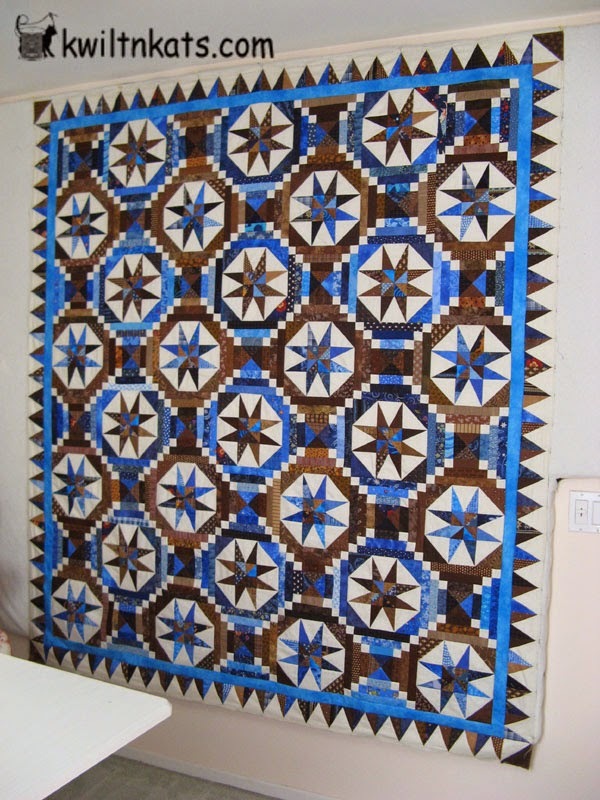 It is a big quilt at 81" x 96" called Blue Moon by Karen Montgomery. Let me finish with my stash stats for this week. Earlier this week at Beverly's I picked up some fabric for the inner border. Do you think it too bright? 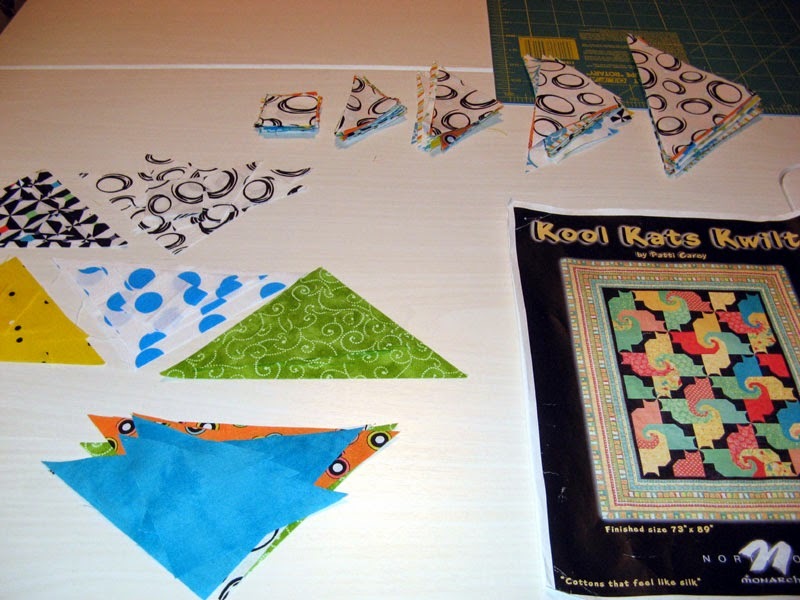 I have yet to make the HSTs that go in the corners. At first I thought it was too bright and now with the photograph it seems to work. What do you think? I purchased enough to go for the binding as well, but that may have to change to something a bit darker. Don't think right now I'd like it in both places. 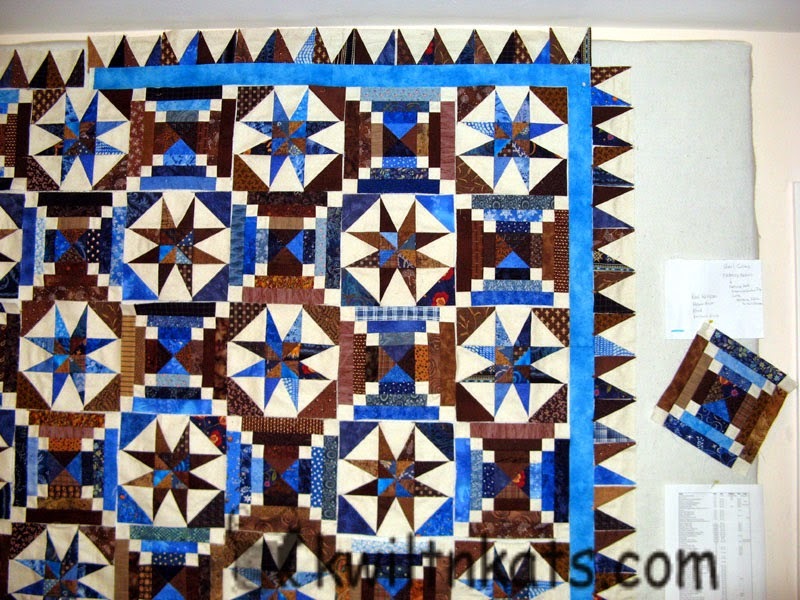 The pieced border isn't that big so the bright blue would be very close to each other. Again, what do you think? Now another "what do you think"... I've got several suggestions going for a name for this project. Several followers have mentioned these ideas: Kool Kolossal, Kabin Fever, Kloud, and Kentuck Knob. I have found through Google searches Kootenay Kabins and Kwail Kabins. Not sure about any of them...any other ideas or do you like one of these? Oh did you notice in the photo I've added a watermark? Tiffany set me up while she was here. I'm still playing with this a bit, but I know how to try different things like size, color pen, and opacity. I'll have it right eventually! I have Kranberries back from Kerry. I'm loving the way my Talkin Turkey turned out. The fabric in the foreground is the backing fabric leftover that I'll use for the sleeve. I have red 2 1/2" strips to cut for the binding. Soon the hand sewing will commence! I finished assembling all the units for the border on Smith Mountain Morning which is my current project. I'm still searching for a good "K" name. I need to pick up a good blue for the inner border and binding. This is a good size quilt. So far it has been all from stash. I've put the pieces on the design wall to see how it will look. It most certainly needs an inner border. The corners of the pieced border will be HSTs of brown and neutral. Tiffany and I are getting ready to tackle more of San Diego today. The weather has been perfect for her visit. There are more updates coming on our adventures around town. 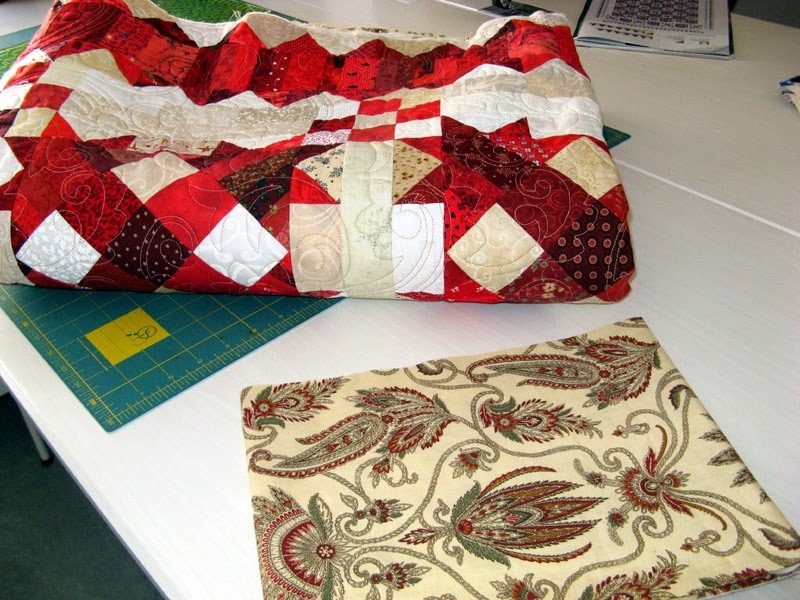 In the meantime find other quilters working their magic through the links of Patchwork Times. 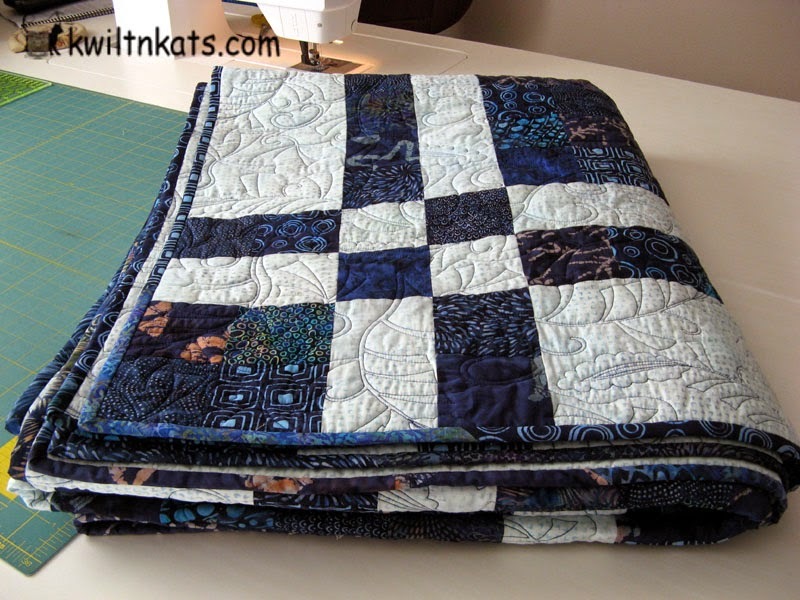 I've been going and doing so much with Tiffany that there has been no change in my quilting stats. We are having a wonderful time. Tiffany has a step counter on her cell phone and in two days we logged 13 miles. We've been to places all over downtown San Diego; all by foot. 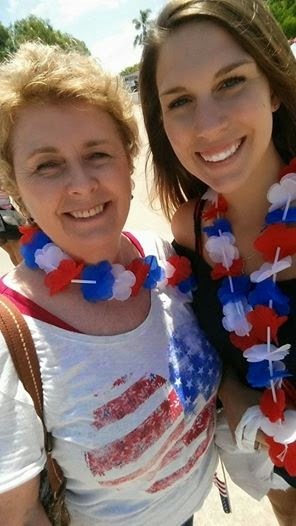 Here's a photo of the two of us on Independence Day. So no change this time. I'm pretty certain the numbers will change next week since Smith Morning Mountain is nearly ready for the final assembly of the border and center blocks. 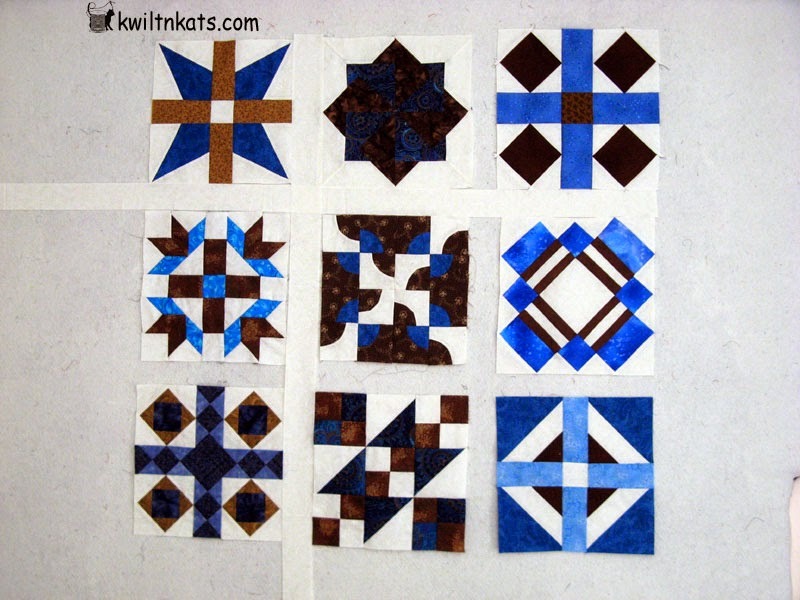 I have the brown pieces cut for the border pieces, blue and neutral yet to go. I wanted to get a couple on the design wall to get a good feel for it. 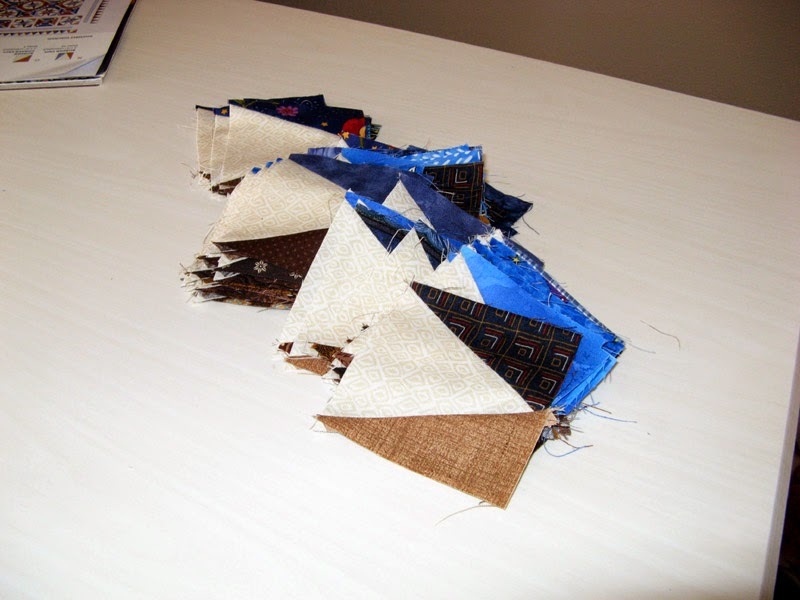 They finish the same size as the pieces in the star blocks; the difference that you see with the lining up will go away once the pieces are sewn together. This project is the one I was working on at the retreat just a couple of weeks ago. I'll be putting sewing on hold for a week as my niece is coming for a visit. Tiffany arrives tomorrow evening...so excited! Last time she was here was 2000. Back then we went to the water park, Sea World and the Safari Park. This year our first day will be the Gas Lamp, Old Town, Seaport Village and the Big Bay Boom to bring in Independence Day. I hope I can keep up! Maybe she'll have to deal with the time change...I'll need all the rest I can get for the HUGE day I have planned for us.